Istanbul is one of my favourite cities, and Sam and I have just spent a fabulous week shopping, sightseeing and gathering inspiration for our next projects during the first annual Istanbul Shopping Festival. So as I enjoy a glass of Turkish wine on the nine-hour flight home (Istanbul direct to Toronto on Turkish Airlines, which even have its own chef on board), I thought I'd share some of my favourite ideas with you. 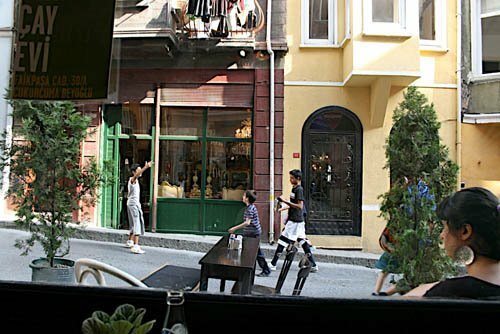 Istanbul is a design hotbed, an amazing destination for apparel and home fashions, materials and ideas. It's one of the best-kept designer secrets, and we love to shop for textiles, antiques and home decor products in the Cukurcuma district. What did we buy? We found a carousel horse that I am having shipped home for our dining room. I plan to set the top half of the horse on one of my tables and have the bottom half set on the floor – very avant-garde. We also found some amazing wooden signs, old chair frames, stone pots and old wall stones, great to simply set on the ground inside or outside of a home. Many of the antique stores also had beautiful antique mirrors that would be fabulous additions to any bathroom or powder room. We feel strongly that it is the diversity – the juxtaposition of textures and colours, the contrast of modern and antique – that makes a room exciting. It is the diversity that creates the drama that creates the best spaces.